Have a question about running? You’re in the right place. Every Tuesday, world-renowned coach, author and athlete Hal Higdon posts and answers athlete questions here. If you have a question for Hal, reach out to him via Facebook or Twitter. The last time I worked on increasing my mileage for a half marathon, I wound up with jumper’s knee. For my next race at that distance, I want to start earlier and bump up more gradually. Should I double the program, stretching it from 12 to 24 weeks? Should I repeat weeks, or go from 5 to 5.5 to 6 to 6.5 and so forth? Or is there some better approach to avoid getting injured? Doubling a 12-week program and converting it into a 24-week program might be one approach. I don’t think it makes much difference whether you run a 5-mile long run twice on successive weeks before moving up versus increasing a half mile a week. You’re still on the same, gentle ramp. But there is another option to consider. I would be more inclined to have you pre-train for your half marathon program. Take time to build a base before stepping on the ramp. 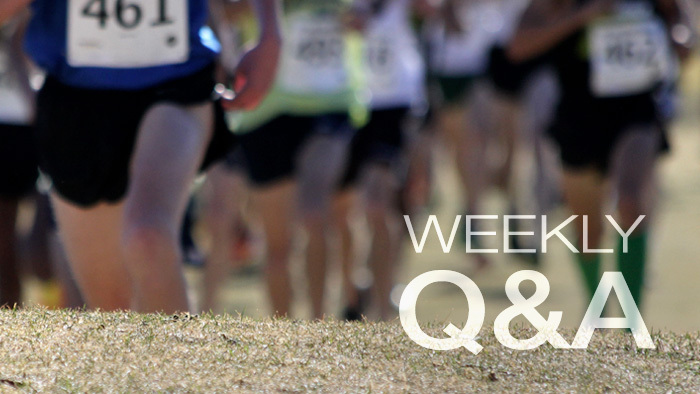 Pick a short-distance program that takes 8 weeks to take you to a 5-K or 10-K race. After that back down into the half marathon program, and you can stretch it any number of weeks from 12 to 24. My Novice 1 Half Marathon program offers a gentle ramp, the long run in Week 1 starting at 4 miles, peaking at 10 miles. Several of the long runs repeat distance before going up again. All added up, the ramp is close to the half mile a week increase you seek. Your knee problems may not entirely be caused by mileage increases. (I am operating from insider information here since I exchanged several emails with the questioner.) You told me that you were jumping rope with the kids, and the rope was too short. Coincidence? Maybe not. What we do away from running can affect our training. Whatever the cause, if the pain returns, consider seeing a sports medicine professional, either a podiatrist or an orthopedist. Something as simple as shoe inserts might get you to the starting line healthy in the race you want to run.